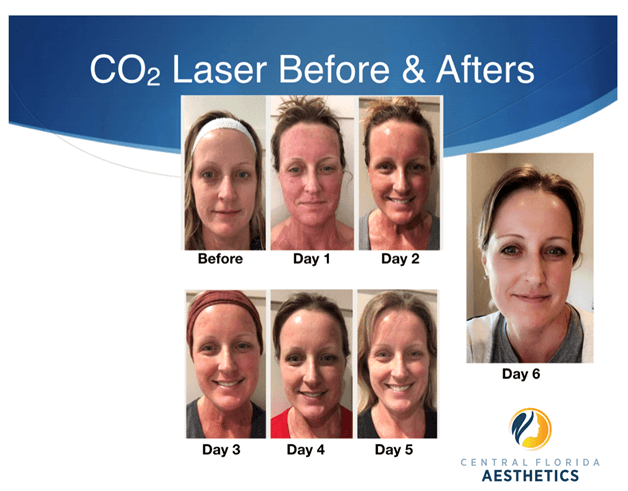 The CO2 laser resurfaces the skin like a chemical peel, while also stimulating collagen formation. As the treated area heals, the new skin that forms is smoother and firmer. Skin quality is improved, and the overall appearance of the skin is rejuvenated. During your consultation with Dr. Dawn Scruggs, she will determine if you are a good candidate for CO2 laser skin rejuvenation. If you have a history of cold sores, you will start taking the prescribed antiviral medication 3 days prior to treatment and will continue 7 days after treatment. Patients may request a sedative to be more comfortable during the procedure. The sedative will be prescribed prior to procedure day, and you may take it after you arrive for your procedure. You will need a ride home. You will be asked to arrive 1 hour prior to appointment time to apply numbing cream to your treatment zone(s). Your treatment zone(s) will be thoroughly cleansed, and you will be given eye protection to wear. The procedure will take between 30 – 60 minutes, depending on treatment zone(s). Expect to feel like you have a bad sunburn – redness, swelling, itching, stinging. Most patients heal between 5 – 7 days. The new, rejuvenated skin will be pink, and will gradually lighten. You will be provided with a ZO® Skin Health Post-Procedure Kit, that helps protect your skin and helps speed recovery time. Use the provided full-face ice mask to help decrease swelling and discomfort. Tylenol or Motrin is sufficient for pain control. Follow-up appointment is scheduled for 1-month post-treatment. Make every effort to minimize sun exposure and use sunscreen liberally every day. Some people may see immediate differences in their skin. This will continue to improve for up to a year. Some patients may require repeated treatments depending on the degree of their sun spots or wrinkles.